XERO | All BRIDE seats / seat rails are made in Japan and of the highest quality. The New Generation Full Bucket Seat XERO was first released on 10/23 and made its debut at the GR 86/BRZ RACE on 10/27/2018. Coming in 3rd for the final round of the series championship, the XERO was a contributing factor in Taniguchi Nobuteru's championship win. 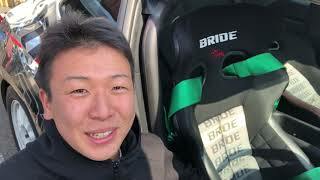 Taniguchi is a race car driver and acts an advisor for BRIDE. Taniguchi Wins Series Champion With a 3rd place finish, Taniguchi has earned the title of Series Champion. 3 Drivers Have Used the Anticipated XERO for Their Races. In its debut race, 3 drivers have competed with the XERO RS. These include: BRIDE's advisor Taniguchi Nobuteru, Orido Manabu. And Kohno Shunsuke, a young hopeful who first competed in the F3 this year. Taniguchi and Orido competed in the championship series, while Kohno competed spot entry in BRIDE's number 55 car. Taniguchi and Orido were confirmed as series champions in the final round with overall rankings of 1st and 2nd in a very hardball competition. We have received feedback from the drivers who installed XERO for their races. Click below to see feedback from the drivers. XERO is available in 8 variations to suit your needs.